In November 2003, shortly before Thanksgiving, I went in for an eye exam realizing my eyes had gotten worse (I wear glasses). As the doctor examined me he began to question me on several things such as diabetes in my family, recent illness, recent level of stress, etc. My reply to all of the above was "no, not really." He asked if I would go to the lab have my blood sugar tested, so I was obedient and did so. Later that afternoon the nurse called with the results, informing me that my blood sugar level was over 300. Not knowing anything about diabetes, I replied, "Sooooooo?" She said, "Well, Deb, that is VERY high and you need to come see the doctor this afternoon or as soon as possible." I went in to see the doctor and he informed me that I had type 2 diabetes. The first two things out of his mouth were: 1. Don't ever come in here and tell me you are healed. Once a diabetic, always a diabetic. 2. Absolutely no herbal dietary supplements are allowed of any kind. He then explained the low down on how to live my life with the diagnosis of diabetes. He prescribed an oral medication to regulate my blood sugar, scheduled further testing and sent me to the clinic dietician who then gave me the information on what I should eat. I went home and lived my according to what I had heard. About 2 or 3 weeks later I went back for my follow-up appointment. The report was not good. My blood sugar had barely dropped at all and now he was going to add more medication for my blood sugar and also Lipitor because my cholesterol too high. I filled my prescription and continued to do what I was supposed to do for 203 more weeks and went back again, Bad news again! My blood sugar was still high and he increased my meds again. The whole time I was eating was they told me to eat and taking all medications as prescribed. Then, the doctor informed me if this didn't work they were going to have to put me on insulin. My heart sank and I was appalled. I HATE needles! To make things worse, he then told we wanted to put me on medication for high blood pressure. He wrote out the prescriptions and I filled them with a feeling of hopelessness. I returned to work and began to cry out to the Lord! HELP! Later that same day a friend came into my office and said, "I don't know what is going on with you, but the Lord told me to share this with you," and gave me one of Beth's flyers. We talked a while and she shared with me how much Beth had helped her... not with diabetes, but with other things. She said, "Do whatever you want, but if worked for me." After she left I thought, "what do I have to lose?" In anger, I called her and told I had been diagnosed with diabetes and asked WHAT if anything she could do for me. Surprised, I am sure at my anger, she was very gentle and asked a few questions, then said she would probably recommend Chromium and/or a few other supplements and said she would like to meet with me to discuss some things. I went to see her, bringing my 3-day diet schedule. I must say after examining it, she was pretty surprised at what the clinic dietician had prescribed me to eat, and said," No wonder your blood sugar is high!" After we talked she advised me to eat no sugar, no processed food and recommended some supplements (Alpha Lipoic Acid and Chromium) to take for the high blood sugar and sugar cravings and also, for the high cholesterol (Ultra Policosanols) and high blood pressure (Coral Calcium Minerals). Finally, I get to tell him what I was going and he couldn't believe it, He was angry and argued with me that these supplements are not FDA approved. I told him I tried it his way and It didn't help. He could not deny the test results. In the beginning of January when I went to see Beth I weighed 200 lbs and now, 11 months later, I (at this writing) weight 140 lbs! That is 60 lbs I lost!!! Now, at this writing I am at the lowest dosage of blood sugar medication and my blood sugar is so low I am considered non-diabetic. My body has even healed to the point where I have lowered some of the dosages on my supplements. Beth teaches about how God made our bodies to heal themselves and what foods we are to eat according to HIS dietary laws. In the beginning it was hard to change and eat some of these food I never heard of or what to do with - like stevia, lentils or wild rice or barley, but Beth provided recipes and lots of suggestions. I found that natural foods are more satisfying and I don't eat near as much as I used to. I don't have sugar or carbohydrate cravings and I have lots and lots of energy! 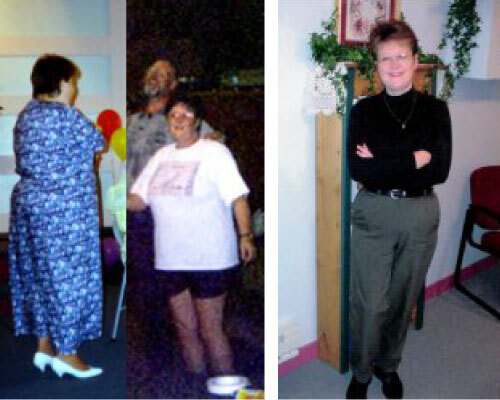 People can't believe how much weight I have lost, many people do not even recognize me! I am a living, breathing totally healed testimony to the truth of God's ways! Are you sick in your body? Do you need health restored unto you? Are you like the woman with the issue of blood, having spent all your money on doctors and other ways trying to heal your body? Why not try God's way?!!! He created your body and the foods to provide the nutrients it needs to heal! Don't let the devil deceive you by saying it's too hard, it's NOT. God gives us all a choice - choose life or death. CHOOSE LIFE! I encourage you to read Beth's books, check out her web site, email her or give her a call to find out what you can do to restore your health. She is God's servant, anointed for her calling! We have had her speak and teach at our church (several times) and I encourage you to invite her to yours. You will truly be enlightened.